Perhaps the biggest tip to keep in mind in terms of your water filtration system is to have a regular cleaning routine. Why is this important? Sediment buildup can cause a filtration system to clog, which leads to inefficiency and breakage. Depending on the individual unit, this routine might vary, but it should be done on a weekly or bi-weekly basis. Do not use any harsh chemicals in the process, but items like mild dish soap and white vinegar should be gentle enough for use. Refer back to your manual for details on how to effectively clean your particular system. Another tip to keep in mind is to replace your filter cartridges on a schedule. For some families, this means keeping a stockpile of the right size and setting a reminder on your calendar or smartphone. Others simply depend on the light on the system to indicate when a change needs to be made. But don’t leave a dirty one lingering! Filters that are left too long can easily become clogged, which is a major issue that greatly affects water quality and could lead to total system damage. At the time you change the filter, also check the o-rings and other rubber components to see if they need replacement, as well. 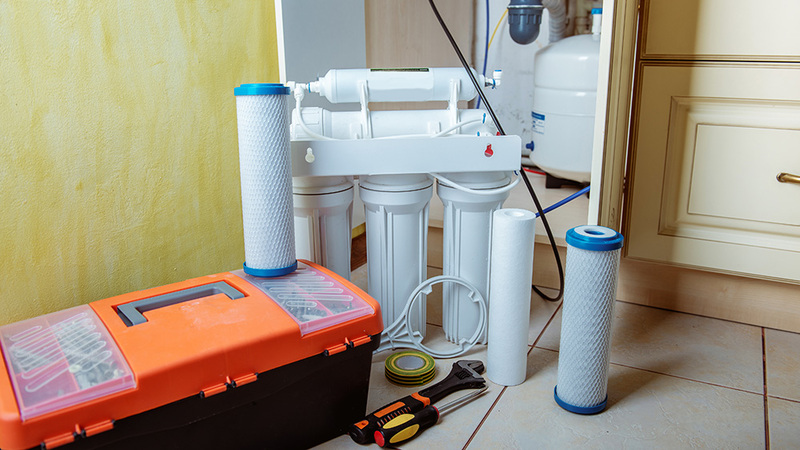 Selecting the right type of water filter for your home and community is important and an integral part of the maintenance process. Some filters are ideal for removing sediment, while others are best for iron-rich water. Determining the ideal one for your needs really depends on your exact neighborhood and water supply source. (For example, those on well-water might have different requirements than those on city water, etc.) Talk with your local filtration system expert or have a discussion with your utility provider before making a decision on which one is right for your home. Household water filters are a lot like other appliances in your residence. After a few years, they don’t work as well was they should, even if they’ve had a perfect amount of maintenance. When this point comes, it is time to invest in a new system. The great part about this is that water filtration devices are consistently getting better and better. What was top of the line at the time you purchased your initial system is likely surpassed by what is on the market now. Think of this as a great way to give your family better water for drinking, bathing, and laundry instead of a costly upgrade. If you feel as though you’ve done all of the above tasks and your water still doesn’t taste as pure as it should, it might be time to call in an expert. While this doesn’t exactly make sense for a small refrigerator unit, whole-home systems require extra attention that only a trained professional can provide. Warner Service offers a variety of repair and maintenance services for malfunctioning well pumps, failing purification systems, and damage caused by iron-rich water. Please contact us today to schedule your appointment.